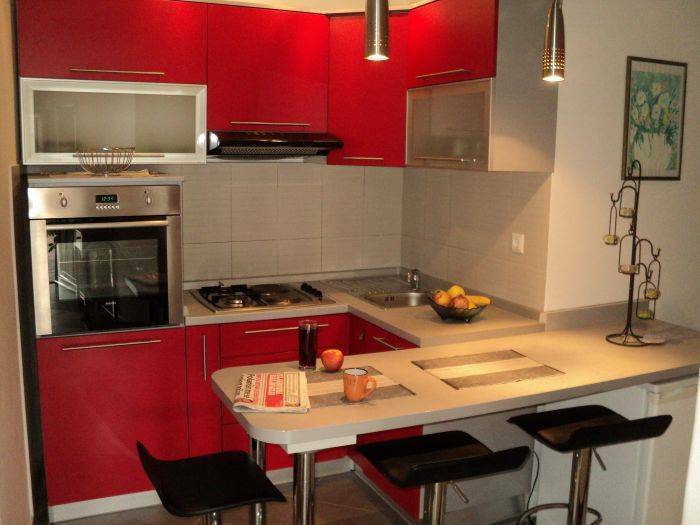 Omis ... Dobry den prosim vas mate volny apartman pre 5 osob volne 2izby?Od 25.7.2015 do 1.8.2015 chceli by sme sa ubytovat dakujem. Apartment Mandić are situated in small town Omiš. In immediate vicinity of all major places like old centre of the town, sand and pebble beach, sport and recreation centre, we give our guests possibility to leave their car in garage and in a pleasant stroll to meet wonders of Mediterranean. If the crystal, clean blue sea is not reason enough for you to visit Croatia, than reach culture heritage, with many visible religious monuments should be. We are trying to provide to our guests, best, comfortable and unforgivable holiday we can! Yare to yare we are making an effort in perfecting our service, so that we can provide you better holiday. Therefore we are inviting you to join large number of visitors, which yare, after, yare get incredible experience during summer and pleasant winter holidays. 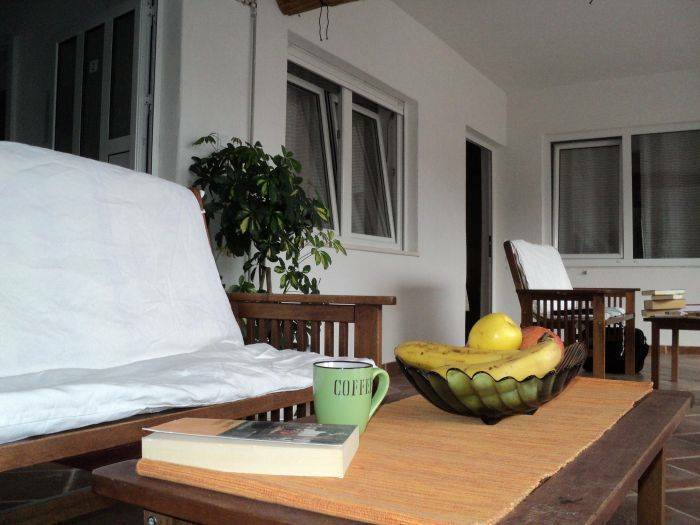 Large terrace, and oriented to the sea are just some of basic natural attribute of our accommodation. Even doe when you decide not to go to some of pebble, and sand beaches, which are in immediate vicinity, you can spend pleasant rest of your time in your apartment enjoying tastefully decorated interior, and blesses of modern technology. Air condition will make sure that you enjoy pleasant night and afternoon when it is weary hot. This type of accommodation will provide you intimacy and in the same time provides you to enjoy interacts and getting know many people who decide to stay in our apartments. This apartment is ideal for smaller family, family with one or two smaller children, so that thy can enjoy in comfort during their holiday. Like every our apartment this one has terrace with seating garniture for four persons. Interior of apartment is really beautiful furnished, and is combined of bedroom for parents where you can use extra bed for child, living room with seating garniture that is predicted for children, fully equipped kitchen and specious shower toilet. Apartment has air condition, TV, DVD, and SAT. You have also safe deposit books for your documents and money. Standard price also includes parking place in garage. 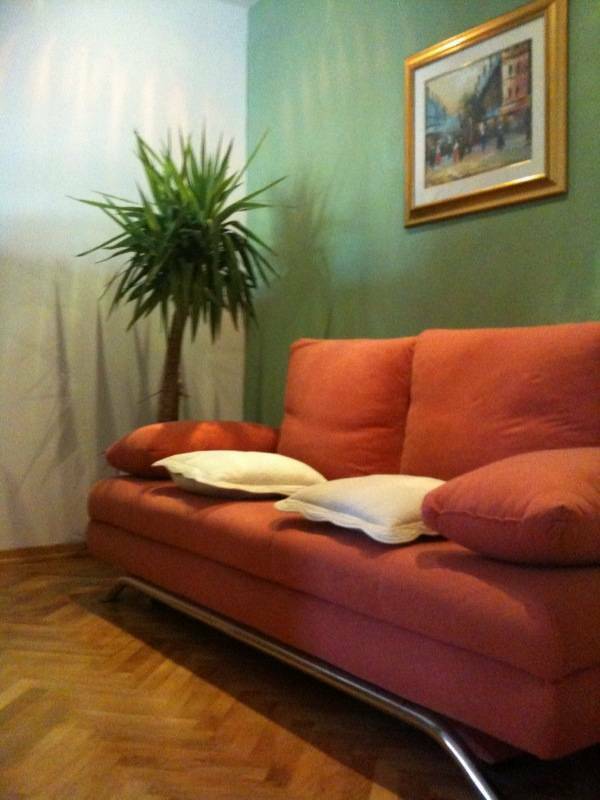 This is the largest apartment in our offer. It is for family of five persons. It is combined of bed room for parents, where you can also use extra bed for child, specious kitchen with table and chairs for six people, living room, another bedroom for children, also with large double bed, and toilette with shower. This apartment also has terrace with seating garniture for five- six persons. To avoid summer heat you can enjoy in your apartment, in could air, because of air condition, while watching TV, DVD, and SAT. You can also in this apartment preserve your values in safe deposit books. Standard price include parking place in garage. 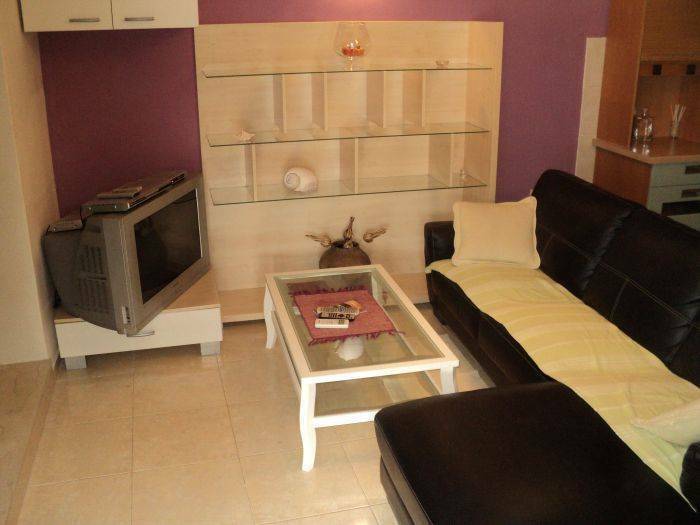 This studio apartment will defiantly thrill you whit its charm and worms. It is suitable for smaller family from two to four persons. Parents can sleep in bedroom and children in living room that adjoins. 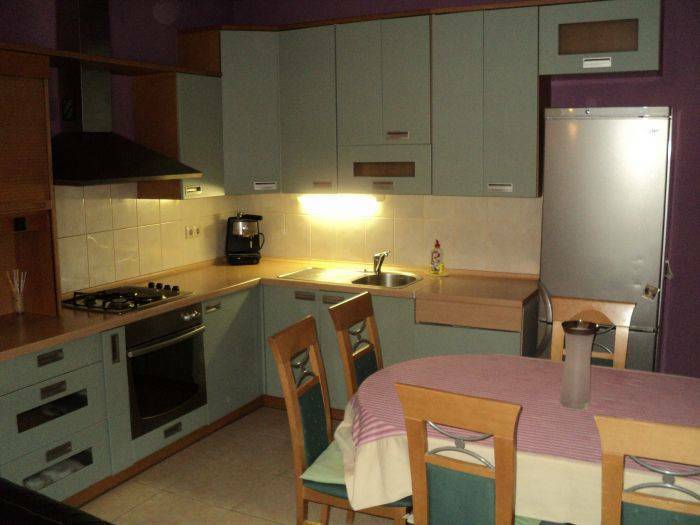 You have also kitchen and toilet with tube, and of course this two are separated areas. Keep cool air with air condition. If you decide not to go on beach you cal always get sun ten on terrace, watch TV, DVD, SAT. This apartment has safe deposit books for your documents, and money. Standard price includes parking place in garage. House is situated next to Adriatic way. 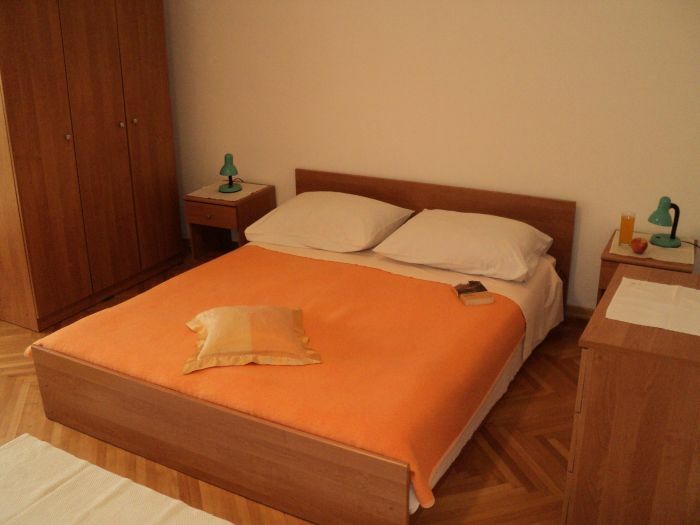 In immediate vicinity you have camp ¨Galeb¨, and mall ¨Studenac¨. We are near the old centre of the town, so that you need not more than five minutes of wondering to it, and two to three minutes to get to beach. There is also football field, tennis court, places to play basketball, sand volleyball ect. If this is not enough you can visit places near, Split, Makarska, and Dalmatian hinterland in form of one day excursion. There is also a town port where you have every day boats that go to islands Brać, Hvar, Vis. We are also able to organise for you transfers and excursions. Seasonal descounts! Before and after main season! We charge 30-50% of total amount in advance in order to make a reservation. In case of no show, we do not refund money, how ever this can be changed in special cases. We organise transfers for our guests. Nearest airport: Split, 25 km.